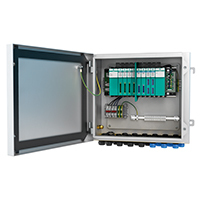 Our enclosure Remote I/O systems offer a cost-effective interface for your field signals in the hazardous and the safe areas to your process control system via the fieldbus. A variety of gateways are available for connection to different fieldbuses. Freely combinable I/O modules and high modularity offer cost-saving installations. The Remote I/O systems are characterized by high functionality and simple handling. Enclosure Remote I/O are mounted in Zone 1 or Zone 21 hazardous areas. They form a modular signal conditioning system to interface signals from the field with a control system in the safe area. Remote I/O connects your conventional sensors and actuators to your DCS using a single standardized fieldbus connection (PROFIBUS, Modbus, Ethernet and others). The plug-in input and output modules can be hot swapped in a running system without the need for a hot work permit. There is a wide spectrum of single and multi-channel I/O modules available offering intrinsically safe and increased safety field connections. This ensures that engineering becomes easy and adaptable to the needs of your plant concept. Enclosure Remote I/O stations are mounted in Zone 2/22 hazardous areas or in the safe area. They form a modular signal conditioning system to interface signals from the field with a control system in the safe area. Remote I/O connects your conventional sensors and actuators to your DCS using a single standardized fieldbus connection (PROFIBUS, Modbus and others). There is a wide spectrum of single and multi-channel I/O modules available offering intrinsically safe and safe area field connections. This ensures that engineering is easy and adaptable to the needs of your plant concept. In our enclosures remote I/O systems could be used modules I/O from Pepperl+Fluchs, Bartec, Stahl or others.